September | 2014 | Bucky's Beer Cheese Co. The Brewers are currently in the midst of a harrowing six game stretch that sees them play the Cardinals and the Pirates on the road, a trip that will almost assuredly decide their playoff fate and most likely the fate of the soul of baseball itself. It’s started off well with a very Cardinals 3-2 extra innings win when a bloop single from a September call up scored Gomez, who had just stolen two bases of off an apparently uninterested Yadier Molina. I know many Brewers fans are at their wit’s end after the Brewers’ disastrous tumble from the division lead to third in the wild card race, so here’s a handy guide on how to cope as you take in these final 11 games. 1) Drink a lot: There’s only one game left on the Brewers schedule that would conflict with your normal 9-5 work schedule (a ghastly 11:35 am start against the Reds next Thursday), so there’s really no reason why you wouldn’t be able to have a healthy buzz on before the singer drops the the final note on “brave” every day. I recommend avoiding Budweiser and Yuengling products at all costs, as well as anything containing the words “Steel City” to avoid accidentally causing the baseball gods to believe you’re supporting the Cards or Bucs. Should you be worried about having a hangover at work the following morning, a good rule of thumb is to limit yourself to one beer for every two innings*. Of course a nice, frosty Miller Lite would be ideal, but if you’re desperate, you can just dump whatever you have into one of the souvenir margarita mugs your girlfriend just needs to have at every game you drag her to. 2) Watch this video: Over and over. 3) Switch games: Should the tide of play seem to be inexorably turned against the Crew, it is permisible at this stage of the season to switch your MLB.tv feed to the Pirates game, to instead root for their opponent. With just two weeks to play, a Pirates loss counts just as much as a Brewers win. 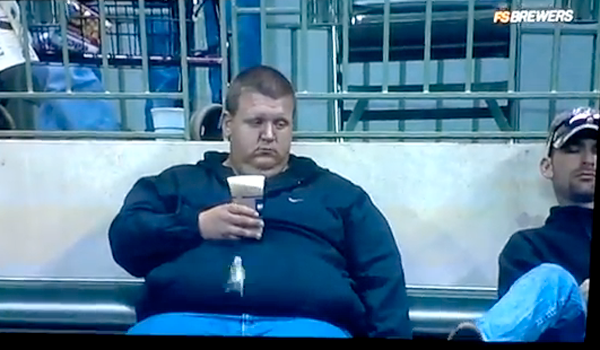 Should you find yourself in this scenario during the Pirates series, simply switch to the Yankees feed and laugh at the incessant slobbering over Derek Jeter’s shambling corpse. Under no circumstances should you switch to the Cubs game, lest you fill yourself with dread at the thought of facing a decade of Soler-Baez-Rizzo-Castoooooooh my god we’re screwed. 4) Remain calm and remember it’s just a game: LOL just kidding, panic.